The Tulsa Drillers turned the tables on Arkansas Saturday night to keep their 2018 season alive. Like the Travelers have twice in the series, the Drillers came through with a late rally to gain a 5-3 win and force a winner-take-all game five Sunday afternoon at ONEOK Field. With a loss ending their season, the Drillers broke a 2-2 tie with three runs in the bottom of the eighth inning to defeat the Travelers and set up one final meeting to determine a spot in the Texas League Championship Series. The best-of-five series will now be decided at ONOEK Field Sunday afternoon with first pitch slated for 1:05 p.m. The Drillers have announced that free tickets on the grass berms will be available for all fans. Fans can use the tickets for free admission or to upgrade to a different seating area in the stadium. The tickets must be purchased at the stadium ticket office which opens at 9:30 a.m. Sunday morning. Tulsa held a 2-0 lead for much of Saturday's critical game before the Travelers struck for two runs in the top of the eighth inning to tie the game. The Drillers had an immediate response in the bottom half of the eighth. Gavin Lux started the rally with a leadoff, ground-rule double. On the next pitch, Drew Jackson shot a double into the right-center field gap that plated Lux with the go-ahead run. The rally continued when a one-out hit by D.J. Peters put runners at the corners for Jacob Scavuzzo who lined the third double of the inning into deep left-center. It scored both Jackson and Peters to give the Drillers a 5-2 cushion. The hit by Scavuzzo proved big when Joseph Odom led off the top of the ninth with his second homer of the series. 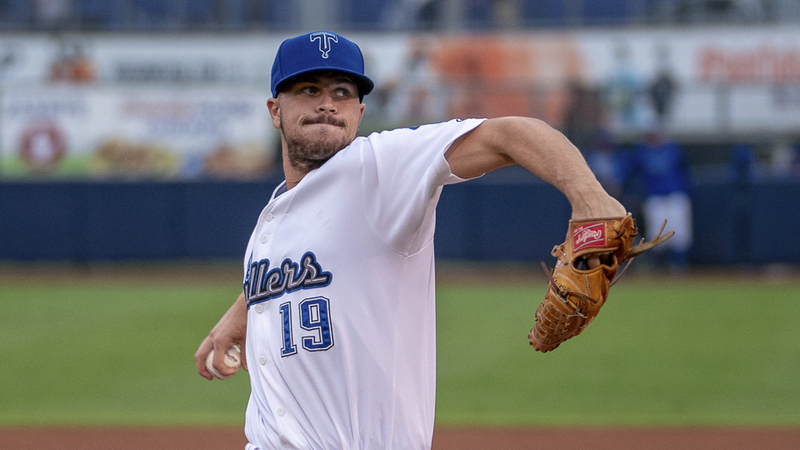 Shea Spitzbarth ended the Travelers hopes of another comeback by retiring the next three batters, closing out the win for Tulsa. The Drillers led for most of the night after jumping in front early with a run in the bottom of the first inning. With one out and the bases empty, Jackson tripled to deep centerfield. Keibert Ruiz followed with a ground ball single to center that gave the Drillers a 1-0 lead. They added a second run in the third. Mike Ahmed led off with a base hit and was replaced on the bases when Eric Peterson grounded into a force out. A double from Lux put runners at second and third for Jackson, and the Tulsa second baseman plated Peterson with a sacrifice fly that upped the lead to 2-0. Starting pitcher Andrew Sopko kept the lead intact with six shutout innings. The right-hander blanked the Travs while allowing only three hits and a pair of walks. For the third time in four games, Arkansas staged a late rally that finally erased the Drillers lead in the top of the eighth. The rally began when Jackson misplayed a ground ball, allowing Yonathan Mendoza to reach safely. After reliever Michael Boyle recorded the first out of the inning, Spitzbarth came on, and Joey Curletta beat the Tulsa shift with an infield grounder to the right side that put runners at first and second. After Eric Filia flied out, Spitzbarth quickly got Kyle Lewis into a 0-2 hole, before uncorking a wild pitch that moved both runners into scoring position. With a full count, Lewis fouled off four straight pitches before lining a base hit into left field to tie the game at 2-2. *Tomorrow's matchup will mark the second straight year that the Drillers have hosted a winner-take-all game five in a North Division Playoff Series. Last season, Tulsa defeated Northwest Arkansas 6-1 in game five. *The victory ended a four-game, home losing streak in playoff games for the Drillers. *Actor and musician Thomas Ian Nicholas threw the ceremonial first pitch before the game. Nicholas played Henry Rowengartner in the baseball movie Rookie of the Year. *Scavuzzo and Lux have hit safely in all four postseason games. *After the game, the Travelers announced that pitcher Williams Perez will come back to start Sunday's game five. Perez was taken out in the second inning of Wednesday's game one after being struck on his throwing arm by a line drive off the bat of Zach McKinstry. *It is appropriate that the series will come down to a game five. Tulsa and Arkansas have played each other a total of 36 times this season with each team winning 18 games.